“The art of leadership is saying no, not saying yes. It is very easy to say yes.” Former UK Prime Minister, Tony Blair, is right. With the modern work week averaging 47 hours and 25 percent of people logging more than 60 hours, Americans work more than any industrialized country in the world. It’s no wonder that few find the time to invest in their happiness. Convinced that coaching illuminates annual themes, I believe 2016 was the year of deliverance. 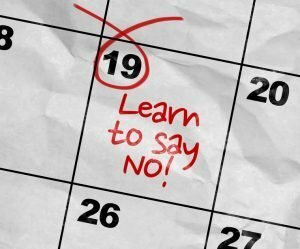 After many years—even decades—of burning the midnight (and weekend) oil, my burned out clients said “no” to unfulfilling careers and excessive work demands. Sound familiar? If you want career happiness, consider saying no to the five things that changed the lives of 86 percent of my clients during 2016. Career Puppeteers. Placing your career in the hands of a company, boss, HR, or any party outside yourself is a big no-no. Take control of your destiny. This means going beyond updating your resume or working hard. Be intentional about your career path. Create a development plan for yourself, take on change, and accept fear. If you’re lost, find a coach who will help you uncover your natural talents and expertise. White-Collar Sweat Shops. Overworked and underpaid roles with zero job security equate to high turnover. Almost everyone experiences this over the course of a career span (yes, even me). Despite hard work, creative resourcing, and high performance, companies increasingly expect employees to produce the same results (or better) while chopping resources. These white-collar sweat shops define insanity. If you find yourself in this situation, then it is time to devise a transition plan. Happiness exists elsewhere. Impostor Syndrome. Are you privately insecure about your skills? Despite achievements, do you express self-doubt or feel fraudulent? Join an estimated 70 percent of the workforce with impostor syndrome. Many leaders experience this syndrome, and it tends to affect more women than men. Unless recognized, executive leaders say it’s a career killer. Join top executives and some celebrities who learned to deal with it. Interview Freeloaders. From extensive writing and marketing samples to very specific operations and behavioral questions, interviewing tactics designed to get free advice is not only tactless, but it’s a recruiting practice that needs to die. Companies don’t operate for free, and neither should you. The next time you are asked “how to” structure a strategy, position, or operation, gracefully withdraw your candidacy and invest your time and energy elsewhere. Negative Nexus. Echoing my 2016 blog, there is a difference between realism and negativity. If negative groups are a part of your everyday life, it’s time to detox. You become your surroundings, and negative people are like E. coli thriving on room-temperature steak. Migrate to groups that boost your endorphins. If the above sounds effortless, it’s not. Almost every client said it was easier to shut up and put up. But succumbing to old habits is a cat-and-mouse machination that always comes to a tragic end.